We provide a concise update on the contemporary management of cardiogenic shock in the setting of acute coronary syndrome (ACS). Early shock recognition, optimal selection and initiation of mechanical circulatory support (MCS), early coronary revascularization, and a team-based, protocol-driven approach are the current pillars of management. Cardiogenic shock complicates approximately 5–10% of ACS cases and continues to have high mortality. Early use of mechanical circulatory may prevent the downward spiral of shock and has significantly increased over time, supported mainly by registry data. In the CULPRIT-SHOCK trial, culprit-only revascularization was associated with a lower 30-day incidence of all-cause death or severe renal failure, compared with immediate multivessel PCI. Routine revascularization of non-infarct related artery lesion(s) during primary PCI for cardiogenic shock is, therefore, not recommended. The routine use of an intra-aortic balloon pump (IABP) was not associated with improved outcomes in the IABP-SHOCK II trial. A team-based and protocol-driven approach may further improve outcomes. Recent advances in coronary revascularization and use of MCS, implementation of shock teams and standardized protocols may improve outcomes of cardiogenic shock in ACS patients. Jayant Bagai declares no conflict of interest. Emmanouil S. Brilakis reports the following: Consulting/speaker honoraria from Abbott Vascular, American Heart Association (Associate Editor, Circulation), Boston Scientific, Cardiovascular Innovations Foundation (Board of Directors), CSI, Elsevier, GE Healthcare, InfraRedx, and Medtronic. Research support from Siemens, and Regeneron, Shareholder: MHI Ventures. Board of Trustees: Society of Cardiovascular Angiography and Interventions. Harjola VP, Lassus J, Sionis A, et al. CardShock Study Investigators; GREAT Network. Clinical picture and risk prediction of short-term mortality in cardiogenic shock [published correction appears in Eur J heart fail. 2015;17:984]. Eur J Heart Fail. 2015;17:501–9. https://doi.org/10.1002/ejhf.260. Wayangankar SA, Bangalore S, McCoy LA, et al. 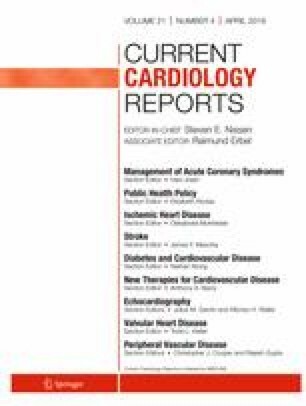 Temporal trends and outcomes of patients undergoing percutaneous coronary interventions for cardiogenic shock in the setting of acute myocardial infarction: a report from the CathPCI Registry. JACC Cardiovasc Interv. 2016;9:341–51. https://doi.org/10.1016/j.jcin.2015.10.039. •• Neumann FJ, Sousa-Uva M, Ahlsson A, et al. ESC Scientific Document Group. 2018 ESC/EACTS guidelines on myocardial revascularization. Eur Heart J. 2018. https://doi.org/10.1093/eurheartj/ehy394 Latest European Society of Cardiology/European Association of Cardio-Thoracic Surgery guidelines that recommend performing culprit-only PCI and avoiding routine use of IABP in AMICS.